Goucher, like all institutions of higher education, has one main purpose: to transform students. The college’s faculty and staff have dedicated a lot of time this summer to reflecting on what it means to learn and be transformed and why students thrive best in on-campus living-learning communities. Town hall meetings and small, informal conversations on these subjects have been informed by President José Antonio Bowen’s recommended reading for all faculty and staff: Transforming Students: Fulfilling the Promise of Higher Education by Charity Johansson and Peter Felton. The book’s theme of transformation has a twofold bearing on Goucher’s campus. Everyone at the college is dedicated to providing students with an education that is informative, as well as an overall experience that is transformative. At the same time, the college has embarked upon the literal transformation of its own campus. Earlier this summer, Goucher broke ground on the first building of a first-year village for incoming students: a 185-bed new residence hall close to the heart of campus that will be completed by Fall 2016. This new dorm will primarily house students in double rooms, with a sprinkling of singles in the mix, and it will feature quiet study spaces, common rooms on each of the three upper floors of housing, a first- floor main lounge, as well as an outside common space that is meant to support community-building. What the dorms won’t feature for first- year students is private baths. “If you ask students if they want to have their own bathroom and be in a single room, they will say they do. But really that’s not what’s best for them,” says Linda Barone, associate director for facilities planning. “First-year students do best when living in a traditional residence hall with shared bathrooms. They get out of their rooms and meet new people. You want the opportunities for creating community, even if it’s a forced thing.”The new residence hall also will support student learning by bringing back the tradition of having faculty and staff live on campus alongside students. The building’s first floor will feature two two-bedroom apartments, one for faculty and one for staff. Progress is being made to bring these laudable intentions to fruition. Since the groundbreaking, construction efforts have focused on erecting fencing for safety, relocating water lines and electrical lines, and linking to an already-existing sprinkler system. 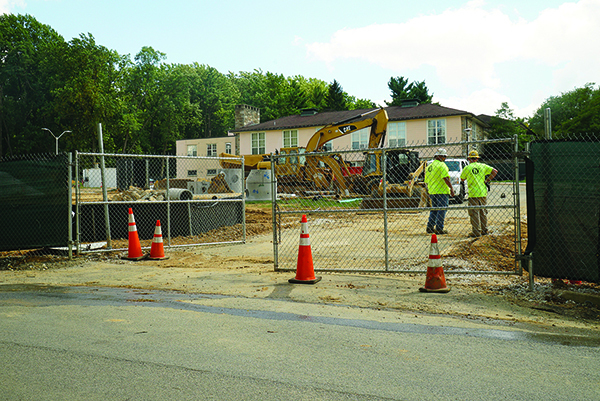 In late July, the construction crews also began digging the foundation for this new residence hall. Additionally, a survey was sent to current and prospective students to get input on the kinds of furnishings and finishes young people want and what kinds of spaces they want to live in. The next phase also calls for creating a large, central, community dining hall at the Pearlstone Student Center and replacing Stimson Hall with an upper-division village that will provide older students with increased independence and privacy in 425 new shared suites and apartments. This article first appeared in the September 2015 issue of the Goucher Quarterly newsletter.